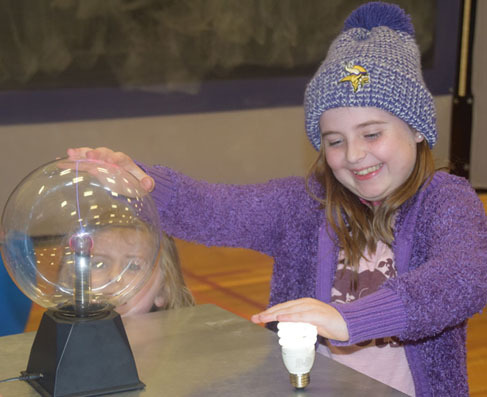 Sloane Hartin learns about electricity as she powers a light bulb with one hand while touching the other to a plasma globe during Tuesday’s Powers of Ideas exhibit, which was held at NDSS. Photo by Adam Prudhomme. The gym at NDSS was transformed into a mini-science centre on Tuesday and Wednesday, as members of the Perimeter Institute brought their mobile Power of Ideas exhibition to the school. Originally launched as part of Canada 150 celebrations, the travelling exhibit went to schools coast-to-coast last year and was brought back this year to tour across Ontario. NDSS science teacher Jody Bonsall successfully applied to have the tour come to Napanee, where is was open students during school hours and members of the public Tuesday evening. All told about 800 high school and neighbouring elementary school students toured the interactive displays. Each exhibit had a team member on hand to explain a little bit about the science behind what they were seeing. The exhibits included a plasma globe which explored electricity, a look into space and black holes, a model of the Large Hadron Collider and a mystery tube made up of four ropes on four different sides. Pull one rope in the mystery tube, and they all moved. It was then up to the students to come up with an explanation as to how they could all be connected. “That’s one of the ways we’re challenging students to think about what they’re seeing in the world around them,” said Kleisath. All of the exhibits were interactive and visual, allowing people to fully grasp the concepts that were being conveyed. Based out of Waterloo, the Perimeter Institute focuses on researching, cutting edge theoretical physics as well as public outreach. Kleisath says the Power of Ideas tour was one example of how they work towards making science more accessible to students and the public at large. They aim to encourage more people to get interested in science.